By Mike Smith: A rematch is being planned between former WBA Super World junior middleweight champion Erislandy “American Dream” Lara (25-3-3, 14 KOs) and WBA ‘regular’ junior middleweight champion Brian Carlos Castano (15-0-1, 11 KOs) for August or September, according to Castano’s manager Sebastian Cortursi. 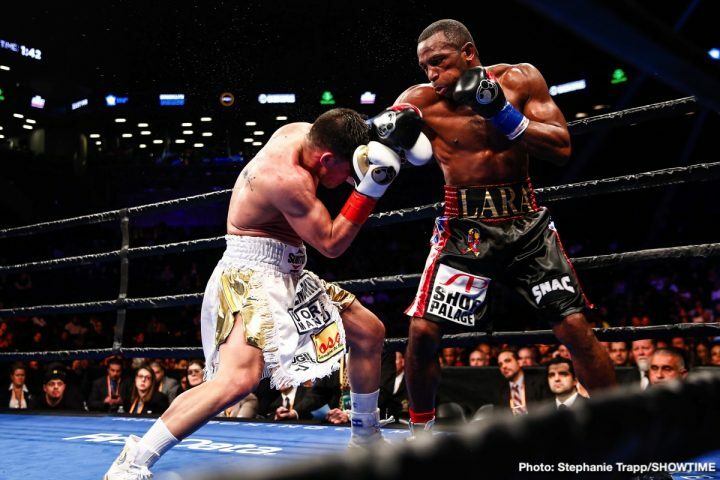 Lara, 36, and Castano fought to a 12 round draw last month on March 2 on Showtime Boxing at the Barclays Center in Brooklyn, New York. For the Castano vs. Lara fight to go through, the World Boxing Association will need to give the green light to letting Castano put off his mandatory defense against Michel Soro. The fight between Castano and Lara was close, and difficult to score. Not surprisingly, both fighters thought they had done more than enough to be given the decision. A lot of boxing fans thought that Castano, 29, had done more than enough to deserve the victory in the fight with his aggression, and attacking style of fighting. Lara fought surprisingly hard, but didn’t look he’d done quite enough to get the win. “If we have to fight him again, I’ll fight him. Hurd or Castaño. Anybody, I’ll have the rematch with both,” Lara said. Lara has come up empty in his last two fights against Castano and Jarrett Hurd. It’s been two years since Lara last won a fight in beating Terrell Gausha by a 12 round unanimous decision in October 2017. That was a long time ago. It’s not that Lara is a shot fighter. He’s just been fighting good opposition in his last two fights against Hurd and Castano. Those are guys that Lara would have had major problems with if he’d fought them a decade ago when he was younger. Lara and Castano need to make things happen now while they still are considered the top of the food chain with the World Boxing Association. The division has suddenly gotten very good, and it’s unclear how much longer fighters like Lara and Castano are going to be able to stay at the top. Breathing down their necks are the following fighters: Jermell Charlo, Julian “J-Rock” Williams, Erickson Lubin, Israil Madrimov and Carlos Adames. Castano picked up the WBA ‘regular’ junior middleweight title on October 2017, and he’s since defended it twice in beating Cedric Vitu by a 12th round knockout in March 2018, and then fighting to a 12 round draw against Lara. Former Cuban amateur star Lara held the WBA 154 lb title from March 2014 to April 2018 for a four year period. However, Lara didn’t do much in terms of taking on talented opposition during that four year period. Indeed, a lot of boxing fans believe Lara mostly milked his WBA title against weak opposition in order to stay champion for all those years. Before losing his WBA title to Jarrett Hurd last year in April 2018 by a 12 round split decision, Lara defended the belt against the following fighters: Terrell Gausha, Yuri Foreman, Vanes Martirosyan, Jan Zaveck, Delvin Rodriguez, and Ishe Smith. Boxing » Erislandy Lara » Erislandy Lara vs. Brian Castano rematch planned for Aug. or Sept.